Before detailing today's activities, I must make note of last night's goings on. Back at the hotel, I was amazed to find an institution that had gone from sleepy to riotous. There were Americans everywhere. God alone knew what they were doing there. They can't all have been on the wine trail as there are very few cellars in Burgundy that are capable of holding that many people, especially People of a Certain Girth. The hotel restaurant was full to bursting; no room for a single English wine merchant. Perhaps mine was one girth too many. I requested the 'phone number of Ma Cuisine from the front desk, 98% sure that they would be shut on a Monday evening and sure by a similar percentage that my only bet was to wander into town and strike up a give-and-take relationship with the first likely establishment I passed. The telephone was answered after two rings, however. 15 minutes, one person? No problem. For those that haven't heard of Ma Cuisine, it is a restaurant in Beaune that has been frequented by wine lovers for years; wine lovers seeking simple but supremely well executed food and a fulsome wine list. More recently, Robert Parker has included it several times in his list of Best Meals of the Year and it has since become a local phenomenon. Booking often requires forward planning, so I was delighted to be offered an instant spot. It's a 10 minutes walk to the restaurant and I was just beginning to feel uncomfortably cold in my extremities when I opened the door onto the exotically aromatic, bistro-style interior of this food-and-drink wonderland. A didn't need long with the menu. After a year's absence, I felt duty bound to my stomach to order the restaurant's signature dish of pigeon entier, cooked rose. The starter was only marginally more thought provoking, but I plumped for compote de lapin and, boy, I was glad I had. It came as a moist pile of shredded meat accompanied by a chutney made from tiny onions and it was delicious. Later on, as I slipped another morsel of pink pigeon meat between my grateful teeth, I wondered whether I shouldn't talk to some friends, maybe ask everyone to select their favourite dish in the world. We could start a club visiting far off locations for long weekends, chasing down our particular pet plates of food. I would bring everyone to Beaune and make them eat pigeon. It's a dish that is placed before one, of which one cuts a mouthful; one examines the mouthful and one decides that it's too big, that the taste buds do not require as much for full sensory pleasure. So one bisects the forkful into something smaller, thus eking out the pleasure into a longer shift: an almost painfully wonderful cycle of bite-relish-swallow. No apologies if this sounds rather over the top. It really is that good. So, today started warmer than anticipated, although the front desk is still warning of forecasted snow. Two types of weather today: fog, then rain. But that's fine. My business lies below ground. And it was an easier start. Day by day I am moving down the Cote, yesterday I started way north in Chambolle, today just outside Beaune in Chorey. Benoit Germain's family own the Château de Chorey and he makes the wine. And what wine! His Beaunes are among the best made anywhere and I would guess that tasters in the years to come, given his '07s blind, may well believe that these are 2005s, so concentrated and fine are they. Chorey to Aloxe and Domaine Follin-Arbelet and I found out more about the small limestone obelisk in his cellar. 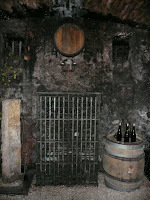 Some years ago, Frank Follin wanted to fid out why his cellar was so damp, so asked a diviner to visit. The man waved his baguettes about, found some subterranean water here and there, then became very excited about this one spot in the cellar, claiming in was where lines of energy crossed. I guess they're what we would call lay lines. So, advised by this diviner, Frank erected a menhir. What is does, I don't know. All I can say is that a) the wines emanating from the cellar are superb and b) Frank looks suspiciously young for a 50-year-old two months away from being presented with his first grandchild. There's a c), too. Ivy grows from outside, down into the pitch black cellar. Yet it always has green leaves on it. From Aloxe….to Aloxe and a rendezvous at the Château de Corton-André. Big tasting here, as the Château commercialises many wines. After the tasting we stopped and had a welcome sandwich and some sticky cakes. And now I am back in the hotel, having just returned from visiting Daniel Rebourgeon in Pommard. My, how I adore this man's wines! They are subtle, elegant, concentrated and utterly toothsome. They are also quite extraordinary value. I just wish he spoke French a little slower. Tomorrow, I am to be driven about by a local Brit. Mike's a negociant who represents a number of domaines in Burgundy and who's lived in or near Beaune for years. We are to visit producers from Gevrey to Meursault and I'll be glad for a chance to peer at the landscape, rather than squint at the road ahead. More tomorrow.